Yesterday I mentioned my mom and I shopped at Corrado's Family Market and bought fresh mozzarella. 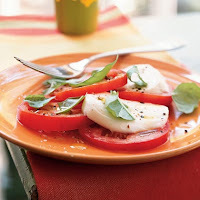 Since today is a hot day here in NJ we thought this popular Italian salad would hit the spot. It's a shame it is too early for the home grown Jersey tomatoes. That would have made this salad perfect. Arrange the tomatoes and cheese alternately on a platter. Drizzle with the olive oil. Sprinkle with salt and pepper (freshly ground) to taste. Serve immediately. This recipe serves three as a side salad.